We all like pictures in books even if we pretend we don't care (I'm looking at you, Grown Ups.) Coincidentally, I love to draw, maybe more than I love to write. So I am going to illustrate everything I write, and if one day Mr. Big-Shot Publisher says I can't illustrate my own books and design my own covers, I will say, "Goodbye." I thought it would be cool to post the 'timelines' for some of these illustrations so everyone can see in glorious detail exactly how pitiful they start out (think Before and After photos for weight-loss programs) and how the only real ingredient you need to churn out a truly polished Piece of Art is not necessarily Talent, but Time. Time, time, time! Also, coffee, a Pandora subscription, and the subnatural ability to live without sunlight or human contact for days at a time like some sort of crab-person. What I love, love, love about this picture is simple: COLOR! I rarely work with much color because most of these illustrations are going to end up printed in plain old paper books, which means black & white. You *can* publish color pictures, of course, but then you have to print on heavier-grade paper which is sometimes glossy and always expensive. Ignoring price (which I can't afford to do, anyway), the thicker, glossier, blindingly bright-white 'paper' I would have to use kind of defeats the purpose of creating books in the first place; that purpose being: to pretend you live a hundred years ago when you curl up with a good book in a cozy corner late at night with a candle burning and it's raining like mad as a horse clip-clops down the cobblestone road outside your little hamlet and the parchment in your hands is old and dry and... um, I mean, I don't do that. Anyways, I would like to work with COLOR! more. After you do a bunch of black & white pictures, and then you crack open the color wheel in Photoshop, you feel like a little kid finger-painting on the walls for the first time. 'Oh, blue? I LOVE blue! Wait, what's this... red? I LOVE red! Hold on... I'm going to mix the red and the blue... OH MY GOSH, I JUST MADE A NEW COLOR!' Yeah, it's like that. Designing cover art is the only time when I can unleash the full palette and go nuts, but like an idiot I decided to use ONE real color on the Pence cover (for reasons) and the cover for The Alleys of Olde Architecture is probably only going to have a tiny splash of ONE color, as well (for other reasons.) But after that, it's open season, baby! It is probably worth mentioning that, although I only posted 21 iterations of this picture, I have about 100 more in my backup files. Which is only to say, when you see 21 images from start to finish, it might make it look easy, or like I knew what I was doing. Why, thank you—I'm flattered! But that is false. This picture took SO long to get right that I have blocked that period of my life out of my memory. I mean, every. single. detail. took. forever. And it still is not quite right. See that rectangular, half-white, half-black border around the picture? Well, when I got these books all printed up, they looked sooooo beautiful... except that border. Because, apparently, although we live in the future and you can literally print the entire dictionary on the head of a pin with lasers and science and stuff, book-printers cannot *guarantee* that your picture will be centered during the final print run. And, sure enough, about 175 out of 250 copies were far enough off-center that my sweet, innocent, precisely-positioned border was entirely cut off on one side and overlapping the spine on the other side. Which may seem insignificant if you are a normal person, but I am a card-carrying crazy person and when you put a book on your shelf and all you can see is the spine, and the spine has a strange line on it jutting into and out of nowhere, it makes you want to set things on fire. So. The lesson is: don't ever make mistakes, and don't ever trust anybody, and don't EVER place any important design elements in the 'bleed margin.' Whatever that is. The lesson I learned from this picture is Don't Be Dumb. Anecdote: I drew the front cover first. Then I drew the back cover, which involved the brutally painstaking process of tying in the new waves and the new fiery sky to the already-made front. This would have been great... if the book had zero pages. It does not have zero pages; it has 330-ish pages and is approximately .75 inches thick. Long story short, I totally forgot about the spine and had to do A LOT of the back cover over again after a severe face-palm and a 3-day timeout to draw and integrate that otherwise unobtrusive white arrow in the middle. This was actually the first major drawing I did on my new fancy-pants art computer, and it, like so many of these pictures, took forever. Without a clue what I was doing, I set the native canvas size for the picture-file to be roughly the size of a billboard, even though the largest book it will ever appear on might be a 6.5 x 9 inch hardcover. Which means I was basically drawing with a one-pixel-wide digital pencil—which is about the width of a normal 'real-world' pencil—on a a canvas that would be about 3 x 4 FEET. Hence the forever-takingness of said endeavor. 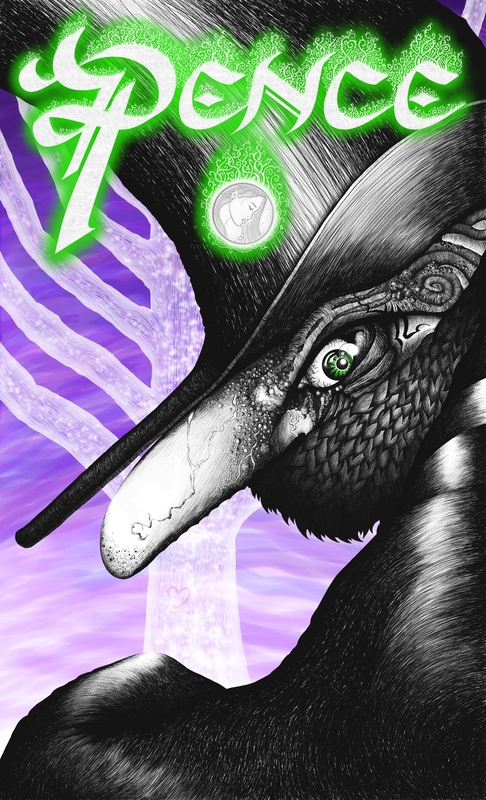 See the creepy bird-man's top hat and the shiny lines on his silk cloak? Those are all hand-drawn line by line by line... 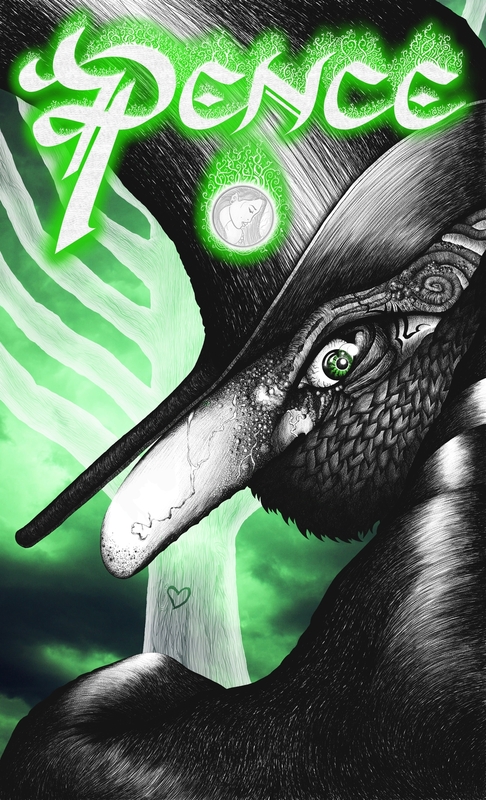 The end result is that this picture looks phenomenal when it is printed out on big poster-paper, and it will probably look pretty good on a book one day, as well, but I spent about 10 times longer on it than necessary. If you are astutely wondering why there are only a handful of timeline pics, that is another result of being a digital art rookie and all-around dumbo. While setting up this site, I was surprised to find I did not back-up very many copies of this project along the way. Alas! This would have been a great one to see the gradual process of; that ugly face went through a ton of iterations, I tried out a gazillion different backgrounds, and it would have been really cool to see those glowing green tendrils on the title 'grow' from one version to the next. Now I know what Juvenile meant when he said, "Back that thang up." This is the second major piece I worked on when I made the move to digital art. You can see in the first few pics I was still experimenting with what type of 'brush' to use. Pretty much any type of real-life paintbrush or pencil or calligraphy pen or stick of chalk you can think of, you can digitally reproduce with amazing fidelity. They have programs that simulate real brushstrokes with hundreds of flexible bristles all interacting in real-time as you sweep the stylus across the screen... It's cool. If you are like me, and you spent the first twenty-odd years of your life struggling with the tips of colored pencils snapping at the wrong time and ink bleeding through the cheap computer paper you squirreled away from your parent's printer and Crayola markers making your paper curl up or just making a bonehead mistake on a nearly-finished picture and having to scrap the whole thing, stepping into the digital art-world is like the gates of heaven opening up before you. There is no way in heck I could do these illustrations on traditional media. But then, you look at the Sistine Chapel and every comic book ever before about 1998 and you realize, hmm, clearly they got along just fine without ergonomic styluses (styli?) with 1048 levels of pressure-sensitivity and gyroscopic tilt accelerometers and you can't help but feel like a lump. Well, I am a lump! I am a lump with an obsessive eye for detail and a lot of free time, and I love my art computer! This picture is still in progress. My best-laid plans are to redraw the old man's face entirely in a style more similar to the front cover, then tie them together (with a spine! ), then finish the other 8 black & white illustrations for Pence, and then edit the whole book again and then publish it sometime before 2055. Piece of cake. This is one of the illustrations I cheated on and did not do entirely by hand. For the tree stump, I ordered my computer to draw a bunch of concentric circles, then I adjusted the width and shading of each ring 'by hand,' then skewed the whole group into a crooked oval. I originally intended to do this just as a guide, then I would go in by hand and redraw each ring 'by hand' so the final result would look a little less perfect, but when I saw how cool the first pass turned out, I decided to keep it. It is, after all, a magical tree. Kind of blurs the lines between 'by hand' and 'computers will replace us all before I turn 40.' Everything *else* I did by hand—but even that is misleading. All the lines in the background? By hand—on a computer. The different shades of glowing fire and light in the background? Also by hand, but with a 'digital airbrush.' Not something I could do with pencil and paper. A picture like this uses about 20 'layers,' which are basically digital versions of tracing paper you can 'see' through, so you can be drawing on, say, the old man's body on Layer 1 without worrying you might mess something up on the background on Layer 2. Layers are BY FAR the most game-changing aspect of digital art; some of these pictures used over 100 layers to keep everything organized. The toughest part of this picture was the old man's beard. It might not seem so tough, given how easy the computer makes everything else, but each coil of his beard had to be drawn right over all the rest, on the same layer, then I would go back and erase some of the intersecting over-or-under lines to make it look like the whiskers are going (you guessed it!) over or under the other curls. Sounds easy—I mean, it's not rocket science—but if you erase one or two pixels too wide, your eye instantly notices something is wrong, and you have to go back and 're-widen' the lines, and if you make those corrections one or two pixels too wide, it jumps out like a sort thumb, and you have to repeat Step 1. And so on, and so on. Finally, I flipped the final product horizontally because I realized when I was done that the old man was holding the knife in his right hand all along, and in the book it has to be his left hand. Like, has to. The original orientation has more of a left-to-right energy, which is all well and good since that is the way our eyes want to read things, including art, but I really like how it looks after the flip because it sort of subverts your inner eye's expectations and adds this funky something-is-wrong uneasiness to the whole affair, and if you look what he is about to do with the aforementioned knife, something definitely is wrong! Another disappointing case of not having a good amount of back-up files. Because I certainly did not complete this picture in 8 Simple Steps. The background was all done by hand; the process for that was kind of cool: these art monitors are designed to swivel around quite easily, so once I got my arm in a comfortable position where I could draw those long, sweeping, slightly-curved lines, I would draw a few of them side by side and then rotate my monitor a few degrees at a time and keep going until I had done the whole thing. There were not any groundbreaking technical achievements on this illustration, other than deciding to draw the grass as white blades on a black background instead of black blades on white, and that turned out well. I really like the way his feet and her dress seem to sink into the turf. My favorite part of this picture is the Princess's dress; specifically, all the patterned bands across it. If you zoom in, every section is different, and it looks just beautiful when it is printed out. To me, her dress is what makes this picture stand out; anything less and the whole thing would be rather blah. I am torn about this picture: I really like how the King turned out, I like his big stone throne and his furry cloak and the weird little chopsticks in his hair and his fairy-tale crown, and I love how the Prince turned out with his funny elf shoes and his pantyhose (?) and the buttons on his tailcoat. It is the background that never quite won me over. I like the checkered floor... and not much else. It is a tricky omelet, at times, designing backgrounds that are in and of themselves visually interesting but that do not draw the eye away from the foreground too much. For instance, those shields on the back walls: if I put them on every section of wall, it will really clutter up the negative space between the King and the Prince, and if I do not have decorations on any of the walls, the room looks barren and unlived in, but two blank walls and two walls with shields does not sit well with me, either. The question becomes: Is it worth the trouble to redesign? Thanks to the magic of digital layers (see the description under Illustration #1) I can remove the entire background with the click of a button, but creating an all-new one might take me 2 or 3 or more days, which means 2 or 3 or more days not writing or working away on new artwork. In dreamland, sure, I would redo everything until it makes my inner-perfectionist weep tears of bliss; realistically, I am lucky if I can squeeze in a couple hours each night on this stuff, so setting aside half a week to redraw something that is already 'done' is a harder sell. Not to mention, when these are eventually shrunk down to book-size (approx. 3.5 x 5 inches) and printed on flimsy book-paper, will this degree of nitpickery still matter? Either way, those shields have got to go... or not. This was the first illustration I did for Pence; you can kind of tell because it is a little weaker the the others. Weaker how? Hard to say... The background is not overly ambitious. The character is not as crisply detailed as some of the others. The quality of the stone tower is not exactly masterful; in fact, I am almost definitely probably maybe going to redraw the tower, or at least cover it with so much ivy you can't see how stupid those white stones look. What was I thinking?! Overall, though, I am pleased with the whole thing; I think it has a very fairy-tale air, which is what I want for this book. And, frankly, all that white space will likely result in this picture looking better and clearer than any of the others when they are all resized and printed in paperback books. I learned a lot working on this one. Any time you start a new series (like a set of illustrations for a single book) you really have to take your time in the beginning when choosing what technical options you are going to employ, ranging from which digital brushes you will use, the pixel-size and opacity levels of said brushes, whether you are going to draw with a perfectly black pencil or a dark gray so you can shade things more subtly, what size canvas to use, what DPI to set your resolution, even what texture of digital paper you want, which effects how your brushes interact with the canvas. Then there are the more stylistic elements you need to consider, like whether you are going to outline characters with hard lines, like traditional cartoons, or whether you will approach them more realistically; whether you will use any special digital effects like gradient shading for beams of sunlight or computer-generated sparkles or whether you want to do all that jazz by hand; how you are going to portray ripples in fabric from picture to picture, how detailed you are going to make people's hair look, how much 'busyness' you want in your backgrounds, etc. If you do not have a firm grasp on this stuff from the get-go, you are are going to end up with a fairly inconsistent series of pictures when all is said and done. Did I say you? I meant me, because that is exactly what happened / is happening. Ah, well, live and learn. I posted these to emphasize how much more important Time and Patience are than Talent. Look at these! They're awful! But a sketch is supposed to be awful. Okay, maybe not 'awful,' but you get the point. Any one of these could be transformed into something awesome with 20-30 hours of Tender Lovin' Care; the trick is to look at the sketch and kind of blur your eyes and envision what it could look like in its finished form. Speaking of which, any ideas about which ones I should use? I still need 7 more illustrations for Pence before I publish it. I am open to suggestions! The Alleys of Olde Architecture is divided into seven Acts; each Act is going to have a title page; this is the first one. Alley lives in a three-mile-high city built on a mountain in the middle of the sea—that is what you are looking at. If I were to draw the whole city, it would be about fifty times taller than this picture and at least twenty wide. My intent is for each of the Title Pages to have a similar feel, which can best be described as: full of lots of minuscule architectural details. No characters. No close-ups. If you want to know who lives in this impossible metropolis and why an enormous ship is about to make port and what that hot air balloon is up to, you will have to read the book. There is not a whole lot to say about the technical construction of this picture. It is a good example of a finished product that looks difficult to produce but which is actually made up of lots of tiny details that are in and of themselves fairly simple. Again, Time and Patience are the real keys to something like this. Hopefully this image will set the right tone when people crack open the book, hinting at an atmosphere of ancient mystery under-girded by just a touch of magic. I want kids to stare at this picture under a blanket-tent with a flashlight late at night and imagine they live there, too, and could walk the streets for a year and find something new around every corner. Oh, boy—this one. Oy! This is the only picture I have posted that did not turn out at all how I wanted. I mean, it's fine. It's not terrible. In case you are unsure what you are looking at, that is supposed to be a mural of a hydra inlaid with silver and gold on a wooden wall (which is why the hydra's scales shimmer in the candlelight.) The problem is, the way I pictured this fantastic mural when I wrote this scene in the book was vastly different, but I couldn't quite do what I wanted to do because it would have required a horizontal canvas, and for these title pages I am committed to keeping them all in a vertical / portrait orientation. So I ended up with this monstrosity. I guess my real concern is that it does not evoke the same spirit of awe as the first title page and the next one... there's just not a lot going on in this picture, even though it is very detailed. In other words, I can imagine kids staring at the other illustrations, pouring over them for hidden clues, getting lost in their labyrinthine twists and turns, wishing they were there... and flipping past this page in about 30 seconds. It was not until I did the third title page that I went back and decided (as I mentioned above) to have each of the title pages showcase a sort of zoomed-out, highly architectural aspect of Alley's world, and this one just doesn't fit the bill. I have a whole new design in mind for a replacement for this illustration that has nothing whatsoever to do with a mural on a wall (although it might make a small appearance, wink wink.) I have not begun the new one yet. As for this hideous blunder? I may end up using it somewhere else in the book—maybe the very first title page when you open the cover—but it may never see the light of day. All right, the big one! Far and away the best thing I have ever drawn from a technical standpoint. This one took me about 150 hours from sketch to finished product. The only bad thing is that I worry it may have set the bar a little too high (in my own mind) for the other five title pages I still need to draw, and I cannot afford to spend 100+ hours on every picture. Or any picture. I basically got no writing done for almost two months, which is kind of counterproductive when the whole reason for doing this is to get books done. As for the technical aspects of How To Draw A Colossal Gothic Library Swirling Up A Hundred Feet From A Bird's Eye View (an obviously foundational skill for all novice artists to learn) I will let the timeline do the talking. All I want to say about this one right now is that it has a looooong way to go, and it is going to be totally mind-blowingly awesome when it is done, because I will not stop until it is totally mind-blowingly awesome.